Fabufit | The Preggie Diaries: I am pregnant, not disabled! In this edition of ‘The Preggie Diaries’ I wanted to share my thoughts of something that has been increasingly annoying me during me pregnancy journey and I am not sure if any of you can relate. If the title of this one is anything to go by, I want to address this misconception largely peddled by the previous generation of women that being pregnant equates to some sort of a handicap or disability. Suddenly because you have this life growing inside you, you are a fragile piece of glass. So, short of wrapping yourself in bubble wrap for the entire nine months – women should move as little as possible, other than the arm that brings food to their face. Sit on the couch and not attempt any sudden movements, pick up nothing heavier than a cereal box else you’ll hurt the baby. It’s laughable really! According to my doctor, babies are a lot more resilient than we think and what the previous generation were led to believe is based on largely myths and outdated medical knowledge that has long been debunked. While many of you have applauded and looked on in awe at the fact that I am still going to gym regularly and working out, there have been some that have looked at me judgingly and have even attempted to complain to the gym instructor in the group class I go to about the weights that I work with, saying stuff like, “Don’t you think it’s wrong that she (as in me) uses such heavy (in their opinion) weights? !” Luckily, my friend, who is the instructor, knows exactly how to answer them. But it doesn’t stop them from glaring at me judgingly throughout the duration of the class. Firstly, like all responsible pregnant women, I discussed my workout routine and what I planned to do during my pregnancy with my doctor and he gave me my guidelines to stick to. Also, with my knowledge in fitness and the fitness professional leading the group class I go to, we know what to adjust and what not to attempt in my current state. But sadly, there is a lot of misconceptions and ignorance around exercise and pregnancy. Unless you have severe and complex medical complications, most pregnant women would get the green light from their doctor to exercise, in fact, if my doctor is anything to go by, he wishes more of his preggie ladies would attempt some form of exercise because the benefits are huge! You know those swollen ankles everyone complains about? – well, that is hugely reduced and even eradicated with regular exercise even if it’s just walking a short distance every day. My doctor says, due to the contraction of your muscles during exercise, it literally pushes the excess water out of your limbs. Winning! Then, exercise also, helps to elevate your mood and I can vouch for that – the stress relief that exercise provides can make you feel less emotional – another win! The most obvious – maintaining a reasonable weight gain! Ok, there is no way you’ll escape weight gain during pregnancy, but you’ll curb yourself from that excessive weight gain if you maintain a regular habit of exercise. During labor – Fitter women have more stamina and energy to push and endure a long labor. Think of labor like participating in an endurance race – you wouldn’t attempt it without rigorous training and preparation – so why would you be willing to go in labor having done little to no physical training to prepare your body for probably one of the most strenuous things you’ll ever put it through? So my parting words to you is, ignore your moms and aunties with their outdated opinions of pregnancy, consult your doctor and find out what level of exercise is safe for you to do and get moving ladies! Please please please! 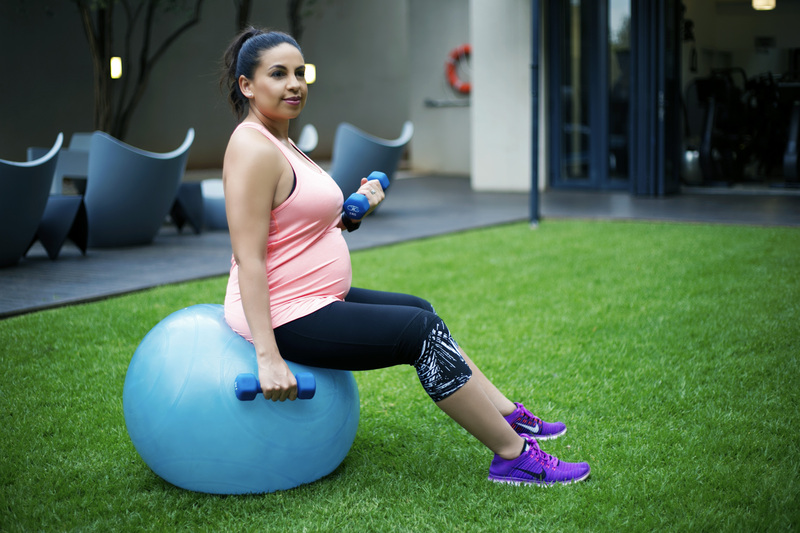 The rule of thumb generally is this – if you exercised before you fell pregnant, you can in all likelihood do the same or similar exercise during your pregnancy, with obviously some small modifications. Monitor your heart rate so it does not spike above 160 beats per minute, causing the blood to rush too fast through your body causing your baby to not get enough oxygen out of your blood as it rushes by. Invest in a good exercise watch that can give you an accurate heart rate. (I use the TomTom Spark Music – I am very happy with it and it is very accurate, I hear the Suunto is great too! Sadly, those Apple watches are not! So don’t bother with those.) Also, avoid abdominal exercises as you don’t want to be tightening those muscles while your tummy is trying to expand. One more thing – give in to cravings for sure! I am the first to say go for it, but within reason. That whole “You’re eating for two now” is nonsense, you’re still eating for one – so yes, you up your food intake slightly, but it is not a license to binge eat every chance you get. Remember, you’ll be left with the results of that 9 months of gluttony long after baby is born. So try to restrain yourself. But most importantly – take care of yourself and your baby – he/she wants you to be healthy and happy. A big part of that is staying active in some shape or form (as I always say, walking is brilliant too!) and eating mindfully.